It is difficult to visualize today, but the mediaeval friary in the centre of Ennis, County Clare originally stood on an island at a point where the river Fergus divided. The exact date of its establishment is uncertain, but the Franciscan order is believed to have been invited to open a new house here towards the middle of the 13th century: Donnchadh Ó Briain, King of Thomond is often credited with being responsible for this shortly before his death in 1242. Thereafter the friary and its grounds became the preferred burial place for generations of O’Briens and MacNamaras, the two ruling families in this part of the country. Frequently in reparation for their misdeeds over the next three centuries they gave the friars, who had little source of income, many gifts such as vestments, chalices, stained glass and books. The advantages of having rich and generous patrons can be seen throughout what remains of Ennis Friary. As the community expanded, so the building work continued. In 1314, for example, Maccon Caech MacNamara added a sacristy and refectory to the site. And a the start of the 15th century, the handsome cloister – only sections of which survive – was constructed along with the south transept: the belfry tower dates from around 1475. Ennis Friary contains many fine limestone carvings, mostly dating from the 15th and early 16th centuries. One of these depicts St Francis, founder of the Franciscan order, with his stigmata on display. Another shows the Virgin and Child, and a third is an affecting image of Ecce Homo, the words uttered by Pontius Pilate in St John’s Gospel when Christ, having been scourged and crowned with thorns, was presented to a hostile crowd. One of the most interesting features in the building is a series of carved panels with scenes from Christ’s Passion dating from a late-15th century tomb erected by the MacMahon family and recycled in the 1840s for a monument to the Creagh family. Unfortunately this has been placed behind glass and spotlit – making it almost impossible to photograph. A copy of the tomb stands on the site of the original in the former chancel. Ennis Friary, like other such establishments, was suppressed in the 16th century but seemingly members of the Franciscan order continued in residence until at least 1570, thereafter being obliged to remain secretly in Ennis. In the early 17th century, Donough O’Brien, fourth Earl of Thomond handed over the site to the Church of Ireland, and services began to be held in the old church. Other parts of the site were used for legal proceedings, the former sacristy becoming a courtroom. The Church of Ireland remained here until 1871 when a new church elsewhere in the town opened and within a couple of decades the friar’s church had lost its roof. It was returned to the Franciscan order in 1969 but is now managed by the Office of Public Works which ten years ago embarked on a somewhat controversial programme of restoration when the decision was taken to re-roof the main body of the church and, as mentioned, to place the MacMahon/Creagh Tomb behind glass. The remains of Ardclinis church, County Antrim, believed to have been founded in the early Christian period by St MacNissi, or perhaps St MacKenna: the present ruins are from the later Middle Ages. A crozier, called the Bachil McKenna, used to be set into the building and was used by local people for the taking of oaths and detection of false statements. However, it was subsequently acquired by a local farmer called Galvin. He and his successors, when not employing the crozier as a hook in the family home, would dip it into water being given to sick cows: in the early 1960s it was acquired by the National Museum of Ireland. In front of the ruins is a blackthorn ‘Rag Tree.’ Traditionally rags, belonging to someone sick or with a particular problem, are tied to a tree in the belief that this will resolve the issue. From The Curse of the Fires and of the Shadows (1897) by W.B. Yeats. Sir Frederick Hamilton was born in Scotland in the late 16th century, youngest surviving son of Claud Hamilton, first Lord Paisley. As youngest son, he was obliged to make his own way and, like so many of his fellow countrymen, saw opportunities in Ireland. Here in 1620 he married Sidney Vaughan whose father, Sir John Vaughan, was a member of the Privy Council for Ireland and Governor of Londonderry (responsible for commanding the garrison and fortifications of Derry, and of nearby Culmore Fort). Two years later he received a grant of land in County Leitrim, he and his wife gradually building up a holding of some 18,000 acres, much of which had been seized from the O’Rourke family, against whom thereafter he remained almost constantly at war. At the centre of his land, he established a town next to an existing settlement called Clooneen (from the Irish Cluainín Uí Ruairc, meaning O’Rourke’s small meadow). This was given the name Manorhamilton and here in 1634 he built a large fortified house. Come the outbreak of the Confederate Wars in the 1640s Hamilton, who during the previous decade had spent time in the Swedish army, once more found himself under attack from the O’Rourkes. In July 1642, in retaliation for their latest assault, he sacked Sligo and burnt much of the town, including the abbey (an event described above by W.B. Yeats). In 1643, after Manorhamilton was unsuccessfully attacked again, he hanged 58 of his opponents from a scaffold erected outside the castle. Ultimately in 1647 he was forced to return to Scotland, having lost hold of the land he had taken in Ireland. He died soon afterwards in Edinburgh. Manorhamilton Castle, County Leitrim is one of six late 16th/early 17th century fortified houses considered as a group by Maurice Craig (in The Architecture of Ireland, 1982). The others are Rathfarnham Castle (A Whiter Shade of Pale, August 26th 2013), Kanturk Castle (An Abandoned Project, December 7th 2015), Portumna Castle (Jacobean Sophistication, August 2nd 2017), Raphoe Palace (From Bishops to Bullocks, July 24th 2017) and Burncourt (Burnt Out, July 4th 2016). All six display an awareness of Renaissance architecture while displaying defensive features such as a flanking tower at each corner. Manorhamilton Castle is the least well-preserved of these properties, and it had one of the shortest lifespans. As mentioned, it was built by Frederick Hamilton in 1634, soon after his return from fighting in Germany with the Swedish army of Gustavus Adolphus (one of Hamilton’s sons was named Gustavus and he would later become first Viscount Boyne). Five years after Hamilton had retired to Scotland and died, his mansion at Manorhamilton was attacked and burnt by the army of Ulick Burke, fifth Earl of Clanricarde, Roman Catholic leader of the Royalist army in Ireland. Badly damaged, Manorhamilton Castle never recovered and soon fell into ruin. What survives of Castlemore, County Cork. Standing on a limestone outcrop, this once-substantial building (caisleán mór: big castle) is believed to have been constructed in the 15th century by the McCarthys, then the dominant family in this part of the world. Towards the end of the 16th century it was held for them by the MacSwineys but then passed into the hands of the Ryes whose main seat, Rye Court, lay just a few miles away (see June 1921 II, January 26th 2019). 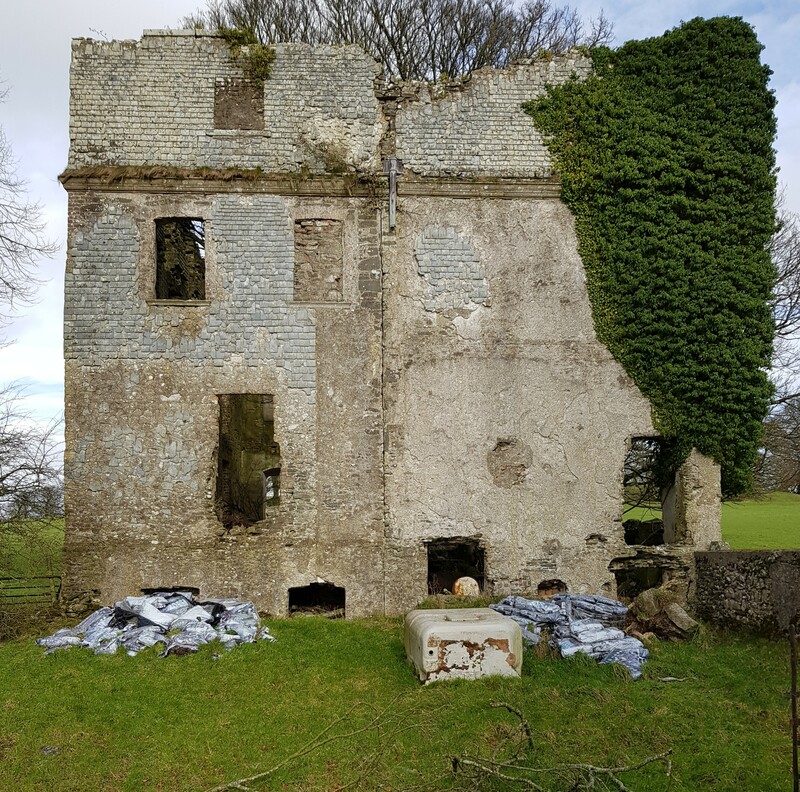 It was subsequently owned, and occupied, by the Travers family but must have been abandoned by them because photographs of the castle taken by Robert French in the late 19th/early 20th show it as a ruin. Still, at least then it was relatively clear of vegetation and also of other properties. Today Castlemore lies in the middle of a quarry and is in very poor condition.